The Olin Robotics and Bioinspiration lab investigates novel approaches to the design, fabrication, and control of small scale robots and mechanisms drawing inspiration from biological systems and materials. 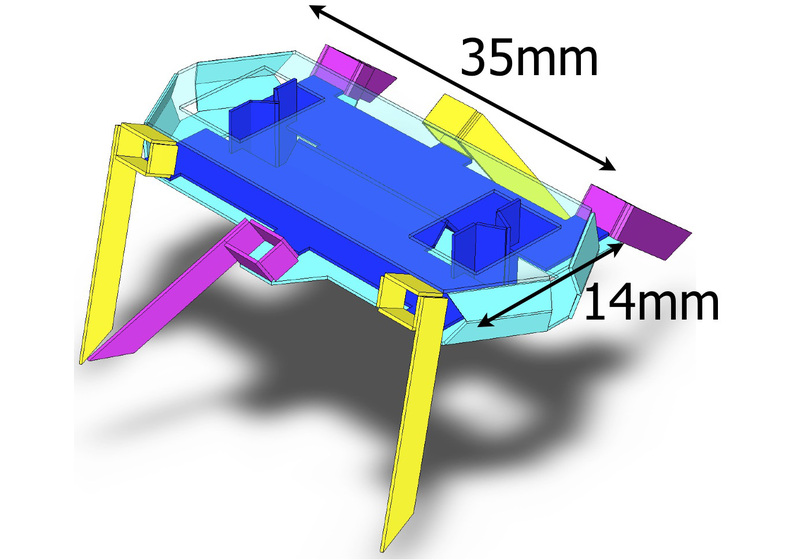 Current research is focused on using underlying principles from biological systems to inform, enable, and improve the design of small mobile robots. As part of that effort, we are also interested in creating and developing new fabrication methodologies and the attendant design tools for rapid prototyping and realization of small scale robots. Aaron gave a talk to the graduate seminar at WPI on designing, fabricating, and evaluating legged robots at the milli- and mesoscales. Congratulations to Shivam and Asa who have graduated successfully and accepted positions at SpaceX and The Oxford Mobile Robotics Group respectively! Big things are afoot over at Dash Robotics! Congratulations to Nick, Paul, Andrew, and Kevin on their successful crowdfunding campaign. 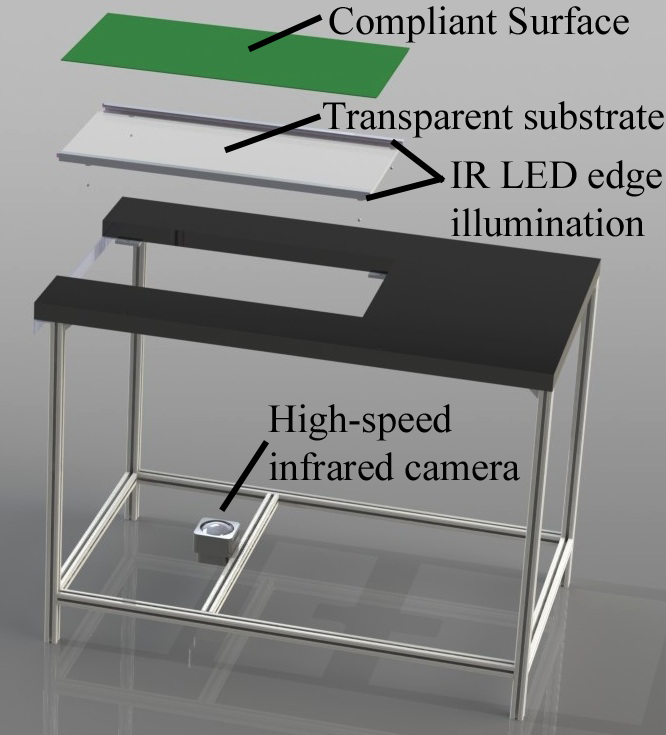 Congratulations to Shivam and Asa whose paper, "A large-area tactile force sensor for measuring ground reaction forces from small legged robots," was accepted to IROS 2013 in Tokyo, Japan! Our work, Ground fluidization promotes rapid running of a lightweight robot, performed in collaboration with the CRAB Lab at Georgia Tech was published in the International Journal of Robotics Research . Dash Robotics will use our fabrication technology to begin selling dynamic, origami robots that you can fold yourself. Keep an eye on their website to find out when their crowdfunding campaign kicks off! An article in New Scientist discusses how our dynaRoACH robot was used to better understand how legged, desert-dwelling organisms can locomote so effectively on sand. Congratulations to Feifei Qian from the CRAB Lab at Georgia Tech (an ORB Lab collaborator) on winning Best Student Paper for Walking and Running on Yielding and Fluidizing Ground! Rapid Inversion: Running Animals and Robots Swing like a Pendulum under Ledges is published in the journal, PLoS ONE. The dynamics of high-speed, underactuated, legged millirobots are very difficult to characterize. Legged systems are fundamentally hybrid in nature (with dynamics described by different vector fields depending on their kinematic state); they may consist of interconnections of continuum compliant members like springy legs with high (or even infinite) degrees of freedom; and the time scales over which events occur are very short. As a first step in better understanding the dynamics of small legged systems, this project aims to create a high speed, multitouch optical force sensor capable of measuring small scale ground reaction forces from small multi-legged systems like the dynaRoACH robot pictured below. This system can be easily integrated with a motion capture system for more complete dynamic state estimation. This project aims to provide the means for optimization of dynaRoACH’s speed, stability and turning. 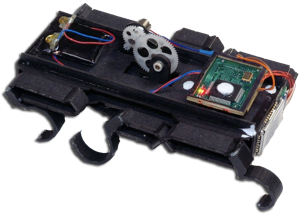 dynaRoACH is a dynamic, six-legged robotic platform approximately 10cm long and weighing 25 grams (depending on the electronics package used to communicate with and control the robot). The robot is capable of running up to 1.6 m/s (or 16 body lengths per second) on smooth hard ground and 0.5m/s (or 5 body lengths per second) on granular media. Mechanical power is provided by a single brushed DC motor, and the robot moves using a bio-inspired alternating tripod gait. The gait is "programmed" into the robot using the kinematics of the linkages that connect the hips and legs back to the gearbox and motor. dynaRoACH uses a unique folding construction that combines laser-cut posterboard laminated with a central polymer layer to create structures from rigid links connected by compliant hinges that get their mobility from elastic material deformation. dynaRoACH's legs are molded from a urethane elastomer and more recent versions integrate shape memory alloy (SMA) actuators to dynamically change the stiffness of a leg in order to induce turning. Rapidly	running	arthropods	like	cockroaches make use of passive dynamics to achieve remarkable locomotion performance with regard to stability, speed, and maneuverability. We take inspiration from these organisms to design, fabricate, and control a 10cm, 24 gram underactuated hexapedal robot capable of running at 14 body lengths per second and performing dynamic turning maneuvers. Our design relies on parallel kinematic mechanisms fabricated using the scaled smart composite microstructures (SCM) process and viscoelastic polymer legs with tunable stiffness. 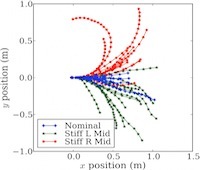 We present experimental validation of the lateral leg spring (LLS) locomotion model’s prediction that dynamic turning can be achieved by modulating leg stiffness. A leg design for active stiffness control using shape memory alloy will enable the robot to execute near-gymnastic 90° turns in the span of five strides. In the Olin Robotics and Bioinspiration lab, our robotic designs frequently make use of a scaled prototyping process derived from the the Smart Composite Microstructures paradigm. These articulated structures consist of rigid composite links joined by compliant polymer hinges. The result is an extraordinarily light and robust robotic system that enables highly dynamic locomotion at a very small scale. However, these structures are typically designed ad-hoc by an engineer with exceptional patience and years of experience working with SCM. The goal of this project is to automate a portion of the design process in order to enable designers to conceive their designs in three dimensions and seamlessly transition between the two-dimensional representation required for fabrication and the more intuitive, functional three-dimensional form.